If you are new to my blog, please feel free to look around! 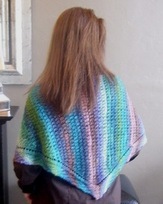 I have other patterns listed for sale as well as a free pattern from the summer issue of Knitty 2008. To tell you a little about myself, I am a middle school math teacher and I use my math skills to design knitting patterns! I choose Yarn Intercept with the graph paper logo because of an Algebra term for graphing lines: y-intercept. I didn't think I could get any better to who I was than to use a play on a math term from one of my favorite concepts to teach. While I don't update my blog as regularly as others, please feel free to add yarnintercept.com to your blog reader and stop by more often! I love new readers. And be sure to let me know if you have any questions about my patterns.